Some people reading “Hola! Buen Camino*” might think I had a lousy time in my five weeks hiking the Camino de Santiago in Spain. 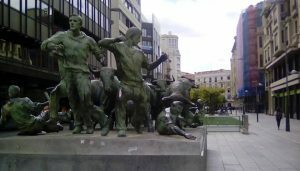 For example, there was my comment on the first 10 days – after starting in Pamplona – being “pretty miserable. My left foot constantly throbbed, until it blistered up and got tough.” And that it took about 10 days for that to happen. This is also a good time to mention that dinners on the Camino were universally delicious. Most of the albergues featured a three-course special, including a salad, main course and choice of desserts. Which may explain why – even though people said I “looked thinner” when I got back home – I actually weighed the same 160 pounds as when I left. One answer? They probably go hungry! I took that picture on September 17, the fifth day of hiking. And aside from a quaint shepherd and his flock, you can also see “some fellow Peregrinos in the background, walking along the road.” That particular day featured a lot of hiking on macadam and asphalt highways, but with more than two months’ hindsight, the picture above right made it all worthwhile. I remember that. While the Camino is normally well-marked, there are times when you can get lost. We’d taken what we thought was the right path, but then discovered there were no other hikers around. That’s when the Spanish lady took the time to point out the error of our ways. But now I’m getting really close to the 1,000-word maximum. So I’ll wrap up with the picture below, from the first day off we took from hiking. We reached Burgos – with a population of some 180,000 – on Friday evening, September 22. (After 10 days hiking.) After checking into our swanky hotel, we went out for a bite at the Cafe Dolar, an American-themed pizza parlor. And as to the “$13 dinner special,” that would have been 13 euros. This entry was posted in Travelogs on December 6, 2017 by bbj1969per@aol.com.